Back in the old days, biotech companies used to dream about becoming a “FIBCO,” as in, “fully integrated biopharmaceutical company.” Entrepreneurs sought to raise lots of venture capital and invest it in everything from research to development to marketing and manufacturing. Most companies failed, but the industry’s first-generation success stories—Amgen, Genentech, Biogen, Genzyme—set a powerful example for a generation of entrepreneurs. The days of starting companies like that are mostly in the past. The amount of venture capital going to biotech is dwindling, as many VC firms have struggled to deliver returns. Entrepreneurs fortunate enough to raise money today are under more pressure than ever to create valuable healthcare products on tight budgets. The pressure, particularly in the wake of the financial crisis four years ago, has forced VCs and entrepreneurs to fundamentally re-think the way biotech companies should be built. This is one of the mega-trends the biotech industry must grapple with this decade, and we at Xconomy are excited to convene a group of thought leaders from around the country to discuss it. 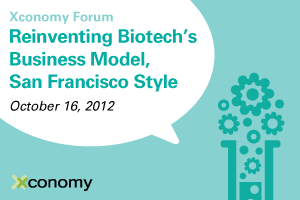 This big new event, “Reinventing Biotech’s Business Model, San Francisco Style,” will be held from 1 pm to 7 pm on Oct. 16 at Onyx Pharmaceuticals’ headquarters in South San Francisco. As always with Xconomy events, I’ll seek questions from attendees, and leave plenty of time for those in the audience to carry on with the conversation during networking breaks. You can reserve a seat at the early-bird discount rate by clicking here. I’m looking forward to this event. My hope is to better connect people and ideas on this issue, which is so vital for the future of biotechnology. See you at Onyx on Oct. 16.